Just a few miles to the east of Maro and Nerja, situated between the towns of La Herradura and Almuñecar lies one of the few marinas along the southern coastline of Spain, Marina del Este. The Marina (also known as Puerto Deportivo Punta de la Mona) was developed in the 1980s around a large natural rock formation known as Peñón de las Caballas (Mackerel Rock) and features a small attractive harbour protected by the pine-clad promontory of the Punta de la Mona. Located in a privileged setting where the peaks of the Sierra de Almijara finally slope into the sea, this area is known for the exceptional quality of its seabed, immersed within the Parque Natural de los Acantilados de Maro-Cerro Gordo (a Natural and Marine Reserve) which has been declared of important ecological value by UNESCO. The Reserve follows a narrow twelve kilometre coastal strip and extends into the Alboran Sea (covering 395 land and 1,415 sea hectares), spanning the provinces of Málaga and Granada. A ban on fishing within the Marine Reserve provides the perfect place for snorkelling and scuba-diving in the crystal-clear waters. Do yourself a favour and take the old N-340 coastal road from Nerja to the Marina (rather than the motorway) for the spectacular views across the horseshoe-shaped bay of La Herradura whilst passing the unique and dramatic coastline created by the steep cliffs (acantilados) along the way. If you have time, you might consider calling in at one of the few sheltered coves between the soaring cliffs, where you will need to take a staircase or steep track down to the beach. As you might expect, Marina del Este is not directly off the road and can be a bit tricky to find by car. To access it you need to turn off the N-340 just after Km 309 (signed for Pto. 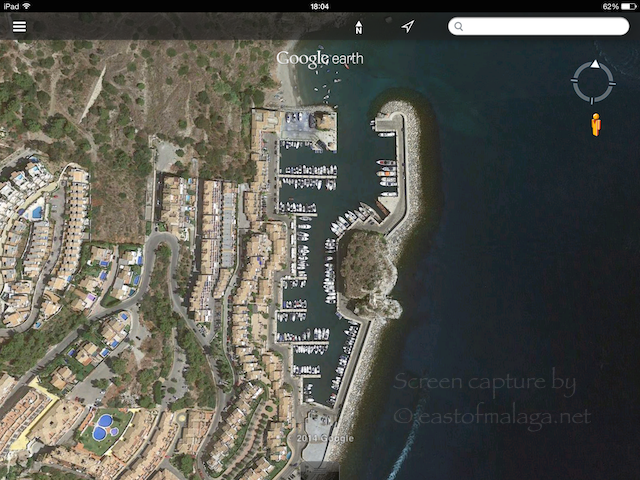 Deportivo Marina del Este) and bear right into the Punta de la Mona urbanisation. Follow the road downhill until you see a sign ahead pointing left towards the Marina. Turn left here past the 4* Hotel Best Alcazar and continue down the hill all the way to the bottom, where there is a free car park. If all the free parking spots are taken, there is an official car park to the right of the entrance of the Marina, where it costs just €3.50 to park for 24 hours. As you enter the Marina, turn to the right just past the barrier and follow the promenade towards Mackerel Rock, past all the beautiful boats. I usually bring a loaf of bread with me to feed to the fishes here. They are always so hungry and entertaining, as they climb over one another to get to the food! Once you’ve walked past Mackerel Rock there are some steps up onto the harbour wall, which is a great place for “watching the ships roll in, and then watch ’em roll away again”. As you walk along the harbour wall you get an elevated view over the boats and spectacular views across to Almuñecar and, as you near the end of the wall, you will see the Blue Flag (currently for 2014/2015) flying near to the entrance of the harbour. If you are interested in chartering a boat for a few days, this is the best place to look. 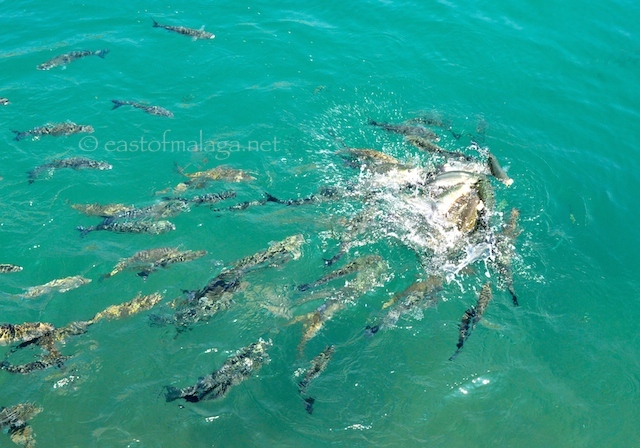 Or, maybe you just want to take a boat excursion for an hour or two around the Cerro Gordo Marine Reserve and to the hidden coves along the coastline, which can also be arranged. There are several diving clubs based at Marina del Este and good snorkelling from the adjoining Playa de los Berengueles, near to the car park. For boat owners, there are 227 berths within the marina (to a maximum length of 35 metres), and all the services you would expect, including a fuel berth, boat hoist (up to 6m), chandlers, mechanics, hardstanding etc. More information from Marinas del Mediterráneo. 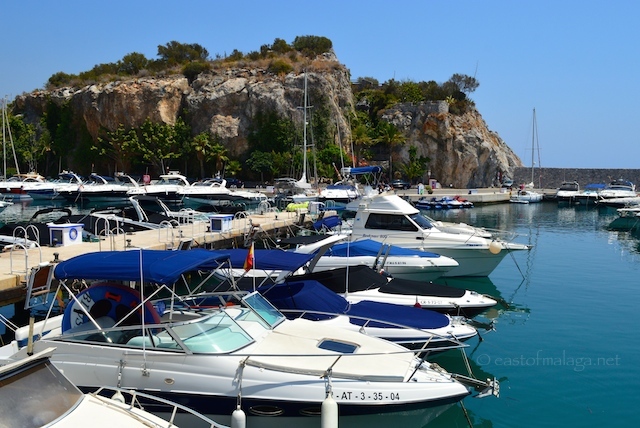 However, if like me, you just want to stroll around the harbour drooling over the beautiful boats, enjoying the peaceful atmosphere and the great views across to Almuñecar, then Marina del Este is a great place to while away a few hours, both during the daytime or in an evening. There is an art gallery, shops and a great selection of bars and restaurants all with outdoor seating, where you can enjoy a cool drink, tapas or a meal. Yes, I’m pretty sure that even Otis Redding would enjoy sitting on the dock of this particular bay! This entry was tagged Andalucía, East of Malaga, Europe, lifestyle, Malaga, photography, Spain, travel. Bookmark the permalink. Its worth warning people to take care driving down the hill to the marina, the roads through the urbanisation built up behind it are badly maintained. They have manhole covers sunk 3 or 4 inches deep in places, along with recessed storm grates etc, the gouges in the tarmac testify to the number of cars that have grounded out. It could be so nice, but if you look a little closer you’ll see the marina is in a bad state of repair, its dirty, badly maintained and the empty units are just left to rot. Yes, you’re right about the road down to the Marina – some of the manhole covers are quite deep – we only narrowly missed hitting one last time we visited. I noticed several cracks in some of the buildings around the Marina – such a shame. I wonder why that has been allowed to happen? Absolutely my kind of place, Marianne 🙂 Should I ever make it down your way…. Great sea side photos. Thanks for sharing. I love marinas, but this is especially lovely. Otis would agree. I love it so much, your ideas of places to visit ! Can’t wait to visit the marina del este ! Thanks ! You’re welcome, Caroline – have FUN! Marianne, there’s a great walk above the Marina. 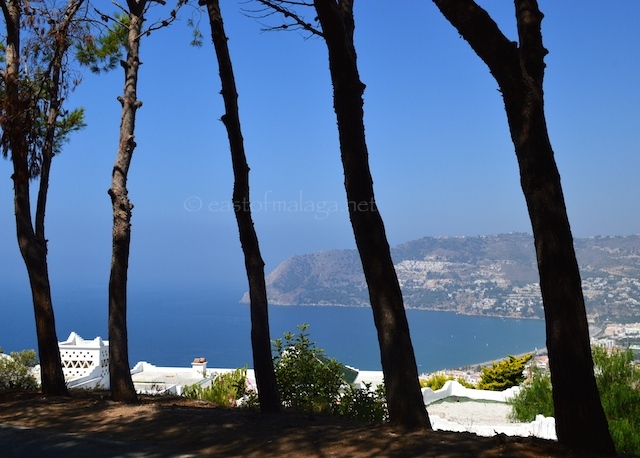 It is accessed via an open gate near the hotel, and leads along the upper hill then takes a steep twisty path eventually down to the beach heading toward Almuñecar. You get a great view of the Marina! I like the crystal clear water in the photo you described as ‘sea entrance to the marina’. Mmmm …. me too, Gilly – I love the way the rocks show through the water. The colour is amazing! It’s nice to dream, once in a while …..
Great play on a great song Marianne. Those pictures are fantastic and you could almost have been making an infomercial for the place, it looks absolutely fantastic there. I’m pretty sure I’d enjoy a mooch. I love placenames in Spain, I find them graphic and entertaining. BTW, this place couldn’t be more beautiful! The name sounds much better than it really is, Ana – it just means Marina of the East! The Marina is definitely worth a visit,Wendy. What time of year is the Jazz Festival? Marianne, it’s at the end of July. It’s outside in a lovely park. Sadly, I am not a big jazz fan, as the man once said, I’ll never understand jazz….